MANCHESTER, England – It was a passionate encounter between England and Scotland and the home fighter prevailed. 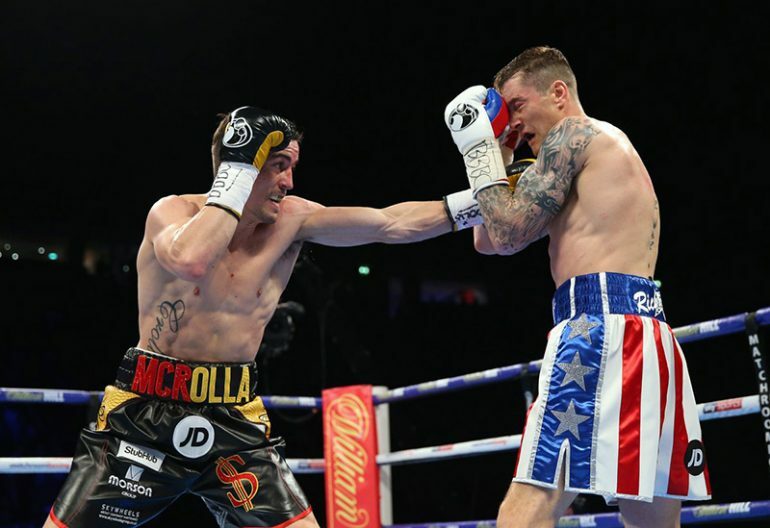 Former WBA lightweight titleholder Anthony Crolla scored a 12-round unanimous decision over Scotland’s Ricky Burns at the Manchester Arena on Saturday and reestablished himself as a player in the 135-pound division. The official scores were 117-112, 116-114 and 116-113. Crolla, who is rated No. 9 by THE RING at lightweight, and Burns duked it out amidst a frenetic atmosphere and the action was superb throughout. Many critics labelled both U.K. stars as has-beens, but the fighters proved themselves where it mattered most. Both men were relaxed before the opening bell and settled into a battle of jabs. Crolla (32-6-3, 13 KOs) found his groove in the second, tagging Burns with the lead hand while working the body well. There was some nice clean work from the home fighter and the crowd cheered every shot. Burns (41-7-1, 13 KOs) joined the fight in Round 4 and varied up his attacks. 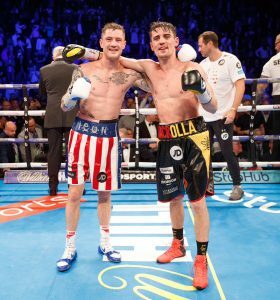 The Scotsman strung together one-twos, backed Crolla up and worked well on the inside. That pattern continued in the middle rounds when both fighters stood head to head and unloaded terrific shots to the body. There was adept foot movement from Burns, but both men were content to mix it up on the inside to the delight of the crowd. Crolla was busy in the seventh, but a brace of sharp right uppercuts worsened a cut around his mouth and drew blood from his nose. The sessions were difficult to score and there were several swing rounds. The ninth was a big one for Burns. He tagged Crolla with the left hook, speared his head back with the jab and bullied his friendly rival. 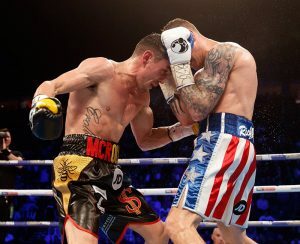 Not to be outdone, Crolla bit down on the gumshield and came roaring back in the 10th, outworking his opponent up-close. Both had their moments and traded with fury down the stretch. 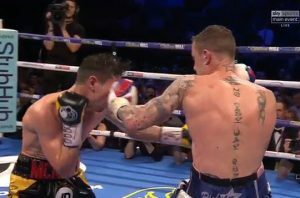 Burns fought a terrific closing round, cracking Crolla with a stream of right hands which had the blood flowing from the wounds on Crolla’s face. In the end, it wasn’t enough. “If Anthony and (promoter) Eddie Hearn are up for it, maybe we can do it again in Scotland,” said Burns. Crolla, like Burns, has been written off throughout his career. He wasn’t supposed to be a world champion. He wasn’t supposed to recover from a fractured skull sustained while foiling a burglary attempt at a neighbor’s home. He wasn’t supposed to recover from back-to-back defeats to Jorge Linares. But it’s never wise to tell the Manchester man what he can’t do. Burns is 34 years old and one would feel compelled to say this is the end. But just remember the history. The Scotsman wasn’t supposed to be a world champion either. He wasn’t supposed to recover from a broken jaw sustained in his controversial draw with Raymundo Beltran. He wasn’t supposed to come back from decision defeats to Terence Crawford, Dejan Zlaticinin and Omar Figueroa Jr.
Expect to see Burns back early next year.